Watch the live recorded streaming video of seminar over the Internet. The seminar broadcast includes speaker videos and coordinated PowerPoint presentations. 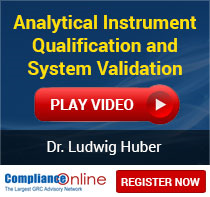 Dr. Ludwig Huber is an expert for FDA and equivalent international compliance and for ISO/IEC 17025 laboratory accreditation. He is also the Chairman, presenter and panel discussion member at US-FDA industry training sessions and conferences. He served as a team member of PDA's task forces "21 CFR Part 11", of US-FDA internal documents, and of the GAMP® special interest group on laboratory equipment. In addition, he was awarded as Presenter of the Year of the Institute for Validation and Technology. He is the author of the books “Validation and Qualification in Analytical Laboratories, and "Validation of Computerized Analytical and Networked Systems", Interpharm Press. Registration: Contact customercare(at)complianceonline.com or call +1-888-717-2436 to get registration details of this seminar.